Deploying AquaDam to counter an imminent flood is a straight forward, three stage, process. A 50m length of 70cm MFD AquaDam can be manually positioned by 4 people and will fit into the back of an estate car or small trailer. The AquaDam(s) are rolled out along the required barrier path. Curves, 90 degree bends and uneven ground are all fine. The AquaDam barrier can be tracked around obstacles such as telegraph poles and parked cars. Portable 3" or 4" centrifugal waterpumps are recommended for filling. Other options include fire hydrants and submersible electric water pumps. Large heavy duty pumps are not recommended. Launching is the term we apply to the starting point of an AquaDam flood barrier. Many flood protection installations are just a single AquaDam, typically 25m, 30m or 50m length. 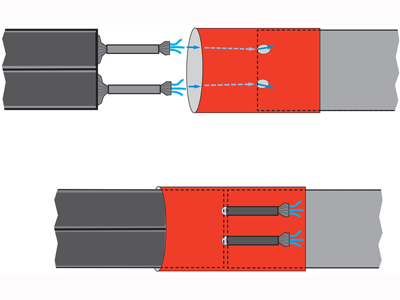 Similarly some installations require multiple AquaDams connected together. 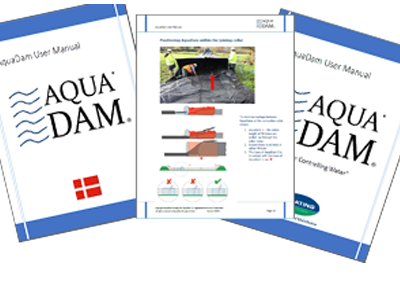 There are 3 main methods of launching the first (or only) AquaDam to form a temporary flood barrier. For For longer temporary flood barriers (typically over 50m) multiple AquaDams are joined together (current record 8km / 8000m!) - see "Gallery" on the Flood Protection menu above. 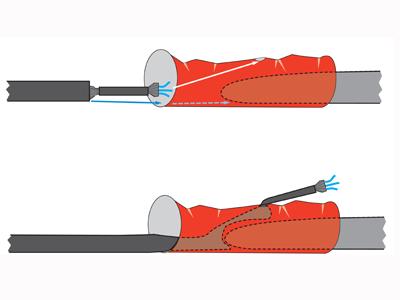 Joining of AquaDam is achieved using a collar system as seen below. Typically, to speed installation once the first AquaDam is set up and filling with water flood responders will move on to next AquaDam to set up ready for filling. Much of the hard physical work is done by a pair of 3 inch petrol water pumps*. Consequently, even quite long temporary barriers e.g. 500m - 1000m can be installed by very small teams. * Most types of water pump can be used to fill the dams. Pumps larger than 4 inch are not recommended. Portability of the water pumps is key to an expedited installation. Training and Support Instructor and installer training packages are an integral part of the AquaDam system. We aim to deliver a thorough understanding of the basic principles of operation plus comprehensive practical product knowledge. This allows emergency planners and flood responders to get the most out of their AquaDam assets. We have a comprehensive array of training material on all aspects of planning, installation, removal, storage and maintenance. Recovery Services Full training on deployment, recovery, storage and maintenance is provided, however, recovery services can be provided through our partner companies. This service includes, removal of your AquaDams after use, a full inspection for signs of damage or wear and repacking ready for the next use. For full details and cost of this service please contact us. AquaDams can be stored inside or outside, on pallets or rolled and stacked. Other solutions to store all the required equipment for an AquaDam flood barrier installation in a portable storage unit are also available. Please call to discuss. Handling AquaDams can be manually handled into position or larger AquaDams can be lifted using a forklift or other lifting equipment.